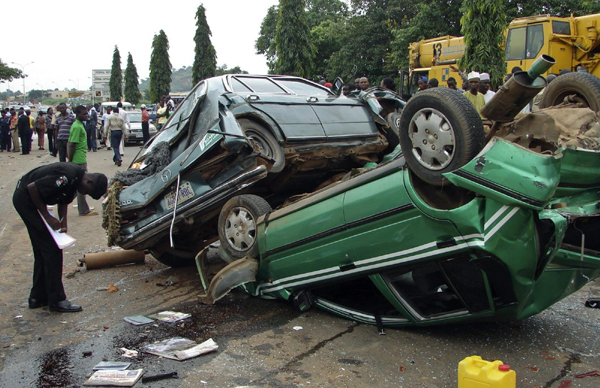 No fewer than sixteen persons lost thier lives in a fatal accident that occurred along Benin-Asaba Expressway on Saturday. The accident involved a commercial bus with the registration number AA137 ASB. An eyewitness, Mariam Jacob, said the incident occurred around Igbodo community, few kilometers to Onicha Ugbo village after the bus driver allegedly crashed into a deep pothole and he veered out of his way while heading towards Onitsha with the passengers, unfortunately summersaulted, leaving sixteen passengers out of the eighteen feared dead. It was gathered that the two other passengers injured were said rushed to the federal Medical Center ( FMC) Asaba where they are currently responding to treatment, while the corpses of the sixteen others were deposited in the same hospital morgue. Then caracas of the ill-fated bus was removed by officials of the Federa Road Safety Commission (FRSC) to their office in Issele Uku community. Although, the damaged bus was removed by officials of the FRSC to Issele Uku community, but the scene of the accident was besieged by a crowd of people believed to be sympathizers. But the state Commander of the FRSC, Random Kulven, who spoke to newsmen in Asaba, confirmed that the accident occurred as a result of high speed, which led to the driver crashing into a deep pothole and subsequently summersualted into the bush. He confirmed that sixteen persons lost thier lives while two others were seriously injured and were taken to the federal Medical Center ( FMC) in Asaba for treatment. At the FMC, the doctors were seen battling to save the lives of the two survivors of the fatal motor accident but refused to allow people into the ward.